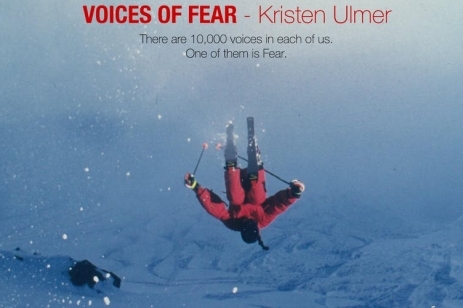 “Voices of Fear” depicts Kristen Ulmer’s relationship with fear during her ascendancy as, by all accounts, the first female big mountain extreme skier. During her career, addiction to fear ruled her life, and the way she dealt with fear took a physical toll on her body and ultimately led to her walking away from the sport that made her famous. Still addicted, it would take several years for her to come into a healthy partnership with fear. Kristen subsequently found a more fulfilling life compared to the one previously defined by taking sketchy jumps into life-threatening and horrifying lines. Describing their personal relationship with fear, over 20 world-class athletes including Conrad Anker, Amelia Boone, Rebecca Rusch, and Jeremy Jones, illustrate the complex ways that all people relate to fear and give insight and depth to how Kristen and the rest of us relate to our lifelong companion – the primal emotion called fear. Join us for a screening of this thought-provoking documentary film which will be followed by an exciting Q&A with Kristen Ulmer herself. Fear Workshop: How do Extreme Athletes Handle Fear / Anxiety and What Can You Learn From Them? Come discover the many ways athletes deal with fear and anxiety, from the worse way to the best way. Learn what your own relationship is with fear is in clear terms, and learn Kristen’s 4-step process to get and stay unstuck from any patterns that hold you back or cause unnecessarily worse fear and anxiety. This is unlike anything you’ve experienced before, and will dramatically lower your fear and anxiety levels, forever. It is a fun, non-threatening, interactive facilitated event led by fear and anxiety expert and former best woman big mountain extreme skier in the world for 12 years, Kristen Ulmer. You DO NOT want to miss this incredible opportunity. Spots for this pre-event are limited to keep it more intimate between the audience and Kristen, so do sign up early as it will sell out.